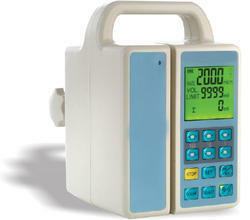 Pioneers in the industry, we offer syringe pump and infusion pump from India. Unique Voice Alarm systemThe device triggered the voice prompt and stop injectionautomatically when there is any malfunction, makingthe infusion process safer and more reliable.flow rate50ml syringe:0.1~1500ml/h;30ml syringe:0.1~900.0ml/h;20ml syringe:0.1~600.0ml/h;10ml syringe:0.1~300.0ml/hthe range of limiting volume 0~999.9mlthe range of injected volume 0~9999.9mlaccuracy of flow rateWithin ±3% (Choose the syringe of specified manufacturer correctly.This accuracy of flow rate is not including the errors of syringe itself. )purge ratePurge rate of 50ml syringe:1500ml/h;Purge rate of 30ml syringe:900.0ml/h;Purge rate of 20ml syringe:600.0ml/h;Purge rate of 10ml syringe:300.0ml/halarm warmsThe pump can give out alarming when injection soon finish,injection finishing, injection of limited amount finished,injection is blocked, syringe falls off, syringe is improperly installed, setting error, AC power has been pulled out,low battery and so on. features functions•	3 Vein Infusion Modes rate mode, time-volume mode,dosage weight mode•	Function to remove bubbles in the tube fast.•	Function to handle fast speed an d large volume ( bolus )•	The system automatically opens up KVO after injection ( reopens vein circulation )•	Function to preset solution volume: the user can preset the solution volume. The machine will auomatically stop then start the KVO function once the preset solution volume is finish.•	The machine automatically records the settings for last injection. It greatly reduces loses workload.•	Function to Auto-define a syringe, complete callibration technology for syringe brand defination that ensures the compatibility of any brand of syringe and injection accuracy.•	Human voice prompt and voice alarm function: human voice prompt and alarm will sound when injection is almost done, injection is finished, preset dosage is done, an injection blockage occurs, syringe device is improperly installed, a wrong speed is set, AC is unplugged, battery is closed to zero.•	Freely stackable: you freely stack onto another to provide multiple solutions, combination solutions has a wide range of clinical applications.•	Modular, can be split and combine freely.•	Power source: AC 110-240V 50Hz: internal battery: DC 12V rechargable lithium battery injection blockedChoose in the three kinds of occlusion alarm pressureaccording to the clinical requirements(High,Medium,Low)KVO rate 1ml/hfuse specificationF1AL/250V ,two fuses(installed inside pump)operating powerAC100~240.0V, 50/60Hz, Power:=30VAInternal rechargeable battery: DC 11.1V,capacity=1600mAh.The device could work constantly more than 4 hour at medium speed running mode, after the battery charged for 10 hours.operating environmenttemperature:+5~+40°C, relative humidity:20~90%storing environmenttemperature:-30°C~+55, relative humidity:=95%, ( No condensation state )atmospheric pressure 860hPa~1060hPasafety levelClass II with insulated enclosure, internal power supply,BF-type continuous normal running equipment.IP grade IPX1dimensions 280(L)×210(W)×130(H)(mm)weight 2.2kgaccessories Power line,operating manual,warranty card,product certification. Function FeaturesUnique door - free structure and big LCD screen, making it easier and more convenient to operate and in the meanwhile avoiding problems of pump stuck and fluid leakage.Unique function to bedside infusion supervision, making patients and their relatives more assured while also reducing nurses' workload if used with 200011 and a data collector Terminal, A bed no. 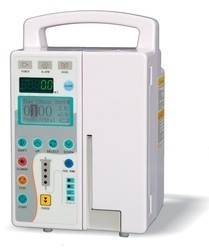 can be set in the machine and then its infusion progress and alarm information can be displayed on the 200011 located at the Nurses' Station and data collector Terminal. The nurse, upon seeing and hearing the signal can go and handle the unit accordingly.All brand of standard IV sets are compatible. with only a simple calibration, it can guarantee an accurate, smooth and safe infusion.When detecting air in line or occulsion, an audio and visual alarm signal shall be given instantly while at the same time the machine stops operation automatically, thus reducing the danger of air embolism to patients.The infrared sensor shall give alarm signal when detecting excessive air pressure.Application of double CPU, marking the infusion process safer and more reliable.Alarm signals are given in case of malfunction or operation error and the machine stops operation automatically. make the injection process safer and more reliable. · HD LCD display working status. · Have store many brands IV sets,Automatically calibration and compatible with any brand infusion sets. · Work mode: ml/h and drop/min, and these two modes can switch freely.